(REG. 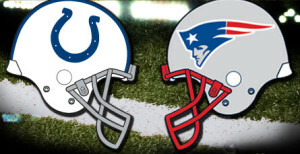 SEASON) 11/18/12: Colts 24 at Patriots 59. New England QB Tom Brady passes for 331 yards & 3 TDs, including 2 to TE Rob Gronkowski (4, 24). Patriots WR Julian Edelman scores on 68-yard PR-TD & 2-yard TD catch. 1/21/07: Patriots 34 at Colts 38. Indianapolis QB Peyton Manning passes for 349 yards & adds 2 TDs (1 pass, 1 rush). 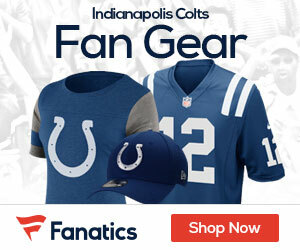 Colts overcome 21-3 deficit as RB Joseph Addai scores game-winning TD run with 1:00 remaining. BROADCAST CBS (8:15 PM ET): Greg Gumbel, Dan Dierdorf, Allie LaForce (Field reporter). Westwood One: Ian Eagle, Trent Green, Tony Boselli (Field reporter). SIRIUS: 88 (WW1), 92 (Ind. ), 86 (NE). XM: 88 (WW1), 225 (Ind. ), 86 (NE). TEAMS MEET for 4th time in postseason. Colts defeated Patriots, 38-34, in AFC Championship Game on 1/21/07. NE is 2-1 in 3 playoff meetings vs. Colts. Patriots lead all-time series (incl. playoffs) 47-29. COLTS: Overcame 28-point deficit (38-10; 45-44) last week, 2nd-largest comeback win in NFL playoff history…Have won 3 of past 4 on road in Divisional Playoffs…Clinched AFC South title for 8th-time since 2003…Have made 11 postseason appearances since 2002, most in NFL…Last week, QB ANDREW LUCK (4) tied for 2nd-most TD passes in postseason game in franchise history (PEYTON MANNING, 5 on 1/4/04). Luck’s 443 pass yards last week were 2nd most in playoff game in club annals (Manning, 458 on 1/9/05). Completed 17 of 24 passes (70.8 pct.) for 314 yards with 3 TDs vs. 2 INTs & 118.1 rating in 2nd-half last game. Will make 2nd career start vs. NE (1st in postseason). Has 8,196 career passing yards & is 1st player in NFL history with 8,000 passing yards in his 1st 2 seasons…RB DONALD BROWN totaled 102 scrimmage yards with 2 TDs (1rush, 1 rec.) last week. Had career-high 8 TDs (6 rush, 2 receiving) in 2013 reg. season. RB TRENT RICHARDSON will play in 1st career game vs. NE…WR T.Y. HILTON had 13 catches last week, tied for 2nd-most receptions in postseason game in NFL history. His 224 receiving yards vs. KC, were 3rd-most receiving yards in playoff game all-time. Had career-best in catches (82) & receiving yards (1,083) in 2013. Hilton is 6th player in NFL history to register 10 100-yard receiving games in the 1st 2 seasons of a career…TE COBY FLEENER posted 5 catches for 46 yards with TD vs. Chiefs last week. Fleener had career-highs in catches (52), receiving yards (608) & TDs (4) this season…LB ROBERT MATHIS has 5.5 career postseason sacks, 2nd-most by Colt since 1982 (DWIGHT FREENEY, 9). Mathis (111 career; 19.5 in 2013) has most sacks in career by Colt & in single-season since 1982. Has 5 career sacks vs. NE (all regular season). LB JERRELL FREEMAN led team with 126 tackles in 2013. Ranked 2nd on team with career-best 5.5 sacks…S ANTOINE BETHEA has 4 career postseason INTs. Posted team-best 9 tackles last week. Has 3 career INTs vs. Patriots (all reg. season). S LA RON LANDRY has 2 INTs in 2 career postseason games…CB DARIUS BUTLER was selected in 2nd round by NE in 2009 NFL Draft. Butler has 4 INTs in each of past 2 seasons. Led team with 15 passes defensed. CB VONTAE DAVIS has 2 career INTs vs. NE…K ADAM VINATIERI owns NFL-postseason record in made FGs (49) & points (205). Spent 10 seasons with Patriots (1996-2005)…Club had 1 player selected to 2014 Pro Bowl (LB Mathis). PATRIOTS: With win, Patriots will advance to 3rd straight AFC Championship Game…Club is 14-4 (.778) at home in postseason, 2nd-best all-time (min. 10 games)…Patriots are 10-6 (.625) in Divisional Playoffs…Posted 8-0 record at home in 2013…NE is 2-0 all-time at home in postseason vs. Colts…Head coach BILL BELICHICK & QB TOM BRADY (17) have most postseason wins by QB-head coach duo…Belichick (18) has 3rd-most playoff wins all-time, trailing only HOFers TOM LANDRY (20) & DON SHULA (19)…Brady’s 17 postseason wins are most playoffs wins by QB in NFL history. Brady has most completions (553), attempts (887) & passing yards (5,949) in NFL playoff history. Brady (42) needs 3 TD passes to surpass BRETT FAVRE (44) for 2nd-most postseason TD passes all-time. Has 17-7 (.708) playoff record, 3rd-best postseason record as starting QB in NFL history (min. 15 starts). Brady is 11-3 (.786) as starter at home in postseason. Has 11 division titles, most by starting QB in NFL history. Brady has 10-4 (.714) record vs. Ind. (incl. playoffs) with 27 TDs vs. 12 INTs & 98.8 rating…In Week 17, RB LE GARRETTE BLOUNT totaled 334 yards (189 rush, 145 KR), most in game by Patriot in franchise history. Joined LE SEAN MC COY as only players in NFL to register at least 180 rushing yards & 2 rushing TDs in game this season. Has 4 rush TDs in past 2 games. Rushed for 127 yards with TD in only career meeting vs. Ind. (w/ TB on 10/3/11). RB SHANE VEREEN had 5 catches for 83 yards (16.6 avg.) with 2 TDs in Div. playoffs last year (vs. Hou. )…WR JULIAN EDELMAN (105) joined TROY BROWN & WES WELKER as only Patriots to have 100+ receptions in season. Posted 1st season of career with 1,000 receiving yards (1,056). WR DANNY AMENDOLA will play in 1st career postseason game…DE CHANDLER JONES had career-high 11.5 sacks in 2013…LB DON’T’A HIGHTOWER had team-best 97 tackles this season…DT CHRIS JONES led all AFC rookies with 6 sacks…CB AQIB TALIB led team with 13 passes defensed. CB LOGAN RYAN led NFL rookies with 5 INTs…S DEVIN MC COURTY has 1 career INT vs. Colts…Club had 4 players selected to 2014 Pro Bowl (QB Brady, G LOGAN MANKINS, CB Talib, WR MATTHEW SLATER).